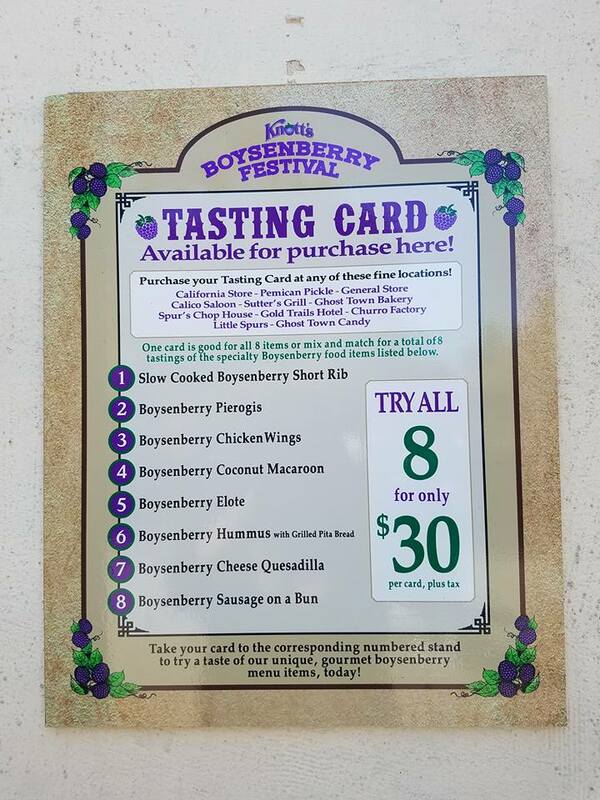 Grab a bib and napkins because Knott’s Berry Farm’s annual Boysenberry Festival is underway! The event takes place during spring break, this year running from March 16 to April 8, though it’s been known to be extended by popular demand. I’m secretly wishing for those results, as the amalgamation of food with boysenberry allows me to eat items I would never have a chance to anywhere else. Walter and Cordelia Knott, founders of Knott’s Berry Farm, moved to Buena Park in 1920 after their attempts at a farm in the Mojave Desert didn’t pan out. Joining his cousin, who grew and sold berries, Walter was savvy enough to buy out his neighbors’ to expand the farm, and to sell their produce by the roadside. In 1923 family friend Rudolph Boysen created a berry that was a cross between the raspberry, the loganberry, and the blackberry, but abandoned it because the strain needed a lot of upkeep. Walter took it on and called it the boysenberry. Cordelia would bake it in her pies and turn it into jams, selling it in her tearoom. By 1934, it became the most popular berry in the country, and remains a beloved food to this day. This year at the festival, Knott’s Berry Farm claimed they were offering over 80 different items. I’ll be honest I kept track, which made for quite a challenging scavenger hunt. In the end, I only managed to find 40. New items for purchase was a boysenberry cinnamon bun and an extremely popular boysenberry boba tea. Newbies of the show that want to try the creations of the year can get a “tastecard” for thirty dollars. In previous years the tastecard was merely a flimsy card to hole punch. This year, Knott’s stepped-up their game by offering a glossy card on a purple lanyard, with rip off tabs, allowing participants to get seconds of their favorite dish. There were plenty of items newly up for tasting this year, such as the slow cooked boysenberry short ribs, which were sweet and smokey. Yummy bites of cheesy goodness called boysenberry pierogies were next to try. Chefs this year also made samples of fusion food. First was the boysenberry elote, a corn on the cob dish. This one had a twist, using boysenberry mayonnaise and boysenberry butter. Another cultural dish was the boysenberry cheese quesadilla: a purple passion of traditional cotija cheese fused with boysenberry salsa and boysenberry sour cream. Lastly there was the boysenberry hummus with pita bread. This Mediterranean vegetarian dish had a flavor twist of bitter syrup. Next on the card was a boysenberry sausage on a bun and dessert, a boysenberry coconut macaroon. The sausage was served with boysenberry ketchup and boysenberry mustard. This strange concoction was surprisingly my favorite this year. As for the macaroon, it tasted exactly like a Girl Scout samoa cookie! Definitely worth buying and taking home! The final dish on the tastecard was the annual boysenberry chicken wings, tangy with a kick. Veteran attendees may skip the taste card and bee line to the faithful foods from past festivals. My first year attending, they had alligator bites with boysenberry aioli, which made a strong comeback. There was also the fan favored chocolate covered boysenberry cheesecake on a stick. As the park has a western theme, I made sure to indulge in calico soda: a boysenberry seltzer water served in a mason jar found in the saloon. Aside from food, the Boysenberry Festival also had a crafts fair and activities. A very popular item I saw patrons purchasing was a cute and clever pie hat shaped like a beret. I myself am guilty of purchasing a mini hair clip pie because it had a marvelous fruit smell. I guarantee if the affair extends I will buy more mini pies to wear! As for activities, I enjoyed making my own delicious mini-pie for five bucks. I also relished watching the annual pie-eating contest. Winners get a face full of pie and a tummy ache. Of course guests can ride the coasters for entertainment, or run into any member of the Peanuts Gang for a photo-op. Though next year’s festival dates haven’t been announced, there is still time this weekend to check out all the sweet treats! Otherwise you’ll have to keep your fingers crossed that they will extend the event for another week. Knott’s plans for the summer include a new thrill ride, HangTime, geared to take place of Boomerang’s old spot on the boardwalk. This coaster will feature a 90 degree climb to the launch, which appears to have an equal 90 degree face first plummet. It will also have a few upside down loops and turns.